The condition of your concrete and substrate is vital to the success of any flooring system. Floor systems will only perform for their expected life if they are laid upon properly repaired and prepared substrates. MSC’s experienced project inspectors will explain where your floor requires repair and how our team will restore your surface to durable and safe floor. 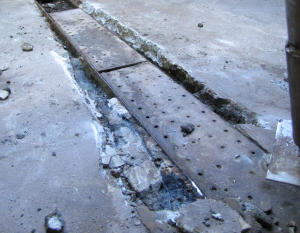 The most common reason for floor coating failures is due to poor preparation of the substrate. Protect your investment by contacting MSC to evaluate the condition of your concrete. We offer you concrete repair and restoration services to ensure the success of your floor system. MSC owns and maintains all of its equipment allowing us to handle any size project. With the help of any of these services along with concrete repair and restoration, you can keep your floors in excellent shape, allowing them to last for many years. With a complete flooring system installed in your facility and proper maintenance to keep it in good condition, you’ll benefit from a facility’s that’s overall safer and more capable of meeting your needs. Don’t wait until the damage to your floors progresses. Instead, seek repairs as soon as possible to effectively maintain your floors, with comprehensive concrete repair services that can cover all of your needs. Eliminate accidents and safety hazards with crack and joint repair by MSC.